Hello! 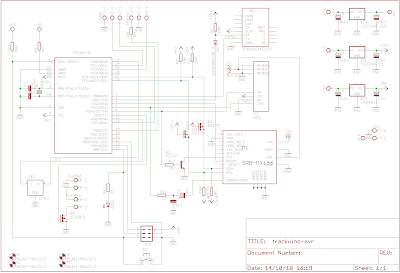 This is a second iteration over my previous schematic. An ICSP header. I'm giving due credit to Kerry D. Wong, from whom I copied this idea. He used the same layout as in the Arduino board, so that he could use the bit-bang method and the same cable described here. An LED. It's connected to pin 19 (Arduino pin 13), so it will blink after flashing a default bootloader. Click on the picture to enlarge it, or just download the EAGLE .sch and libraries from my repository.